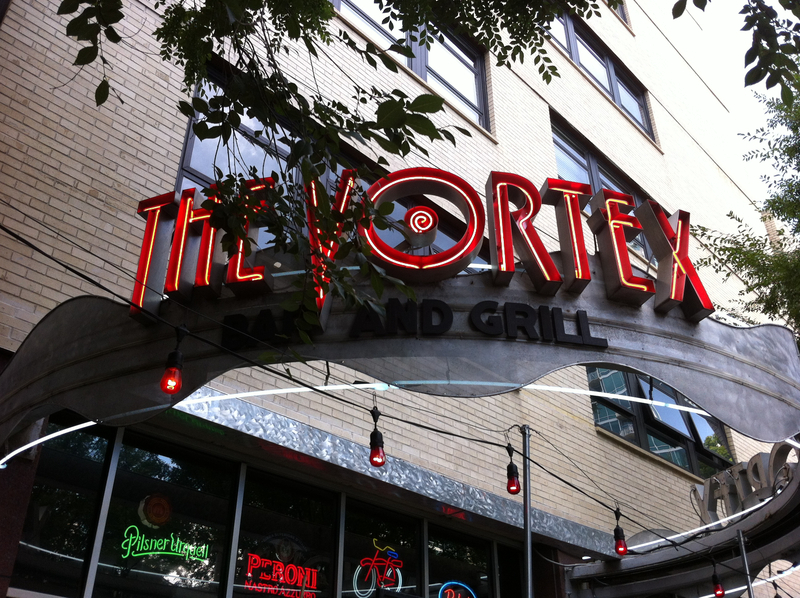 The Vortex Bar and Grill is a giant on the Atlanta burger landscape. When the Georgia General Assembly passed a law several years back requiring the removal of the smoking section from any restaurant that served children, 99%+ of the restaurants banned smoking all of the time. The Vortex was an anomaly. They said, basically, that they earned more money from smokers than they ever did from children, so no one under 18 is allowed in at any time. They will card you at the door, if there’s a question. And, if you didn’t like the decision, they said not to complain to them, complain to your local representative. They were the ones that forced restaurants to make a choice. That single act pretty much sums up their “like us if you want, we don’t really care” attitude. Around the same time that the WSJ declared the Ghetto Burger at Ann’s Snack Bar as the best burger in America, the Vortex made the best of Atlanta list, along with the bleu cheese burger at the Earl as being the top three. 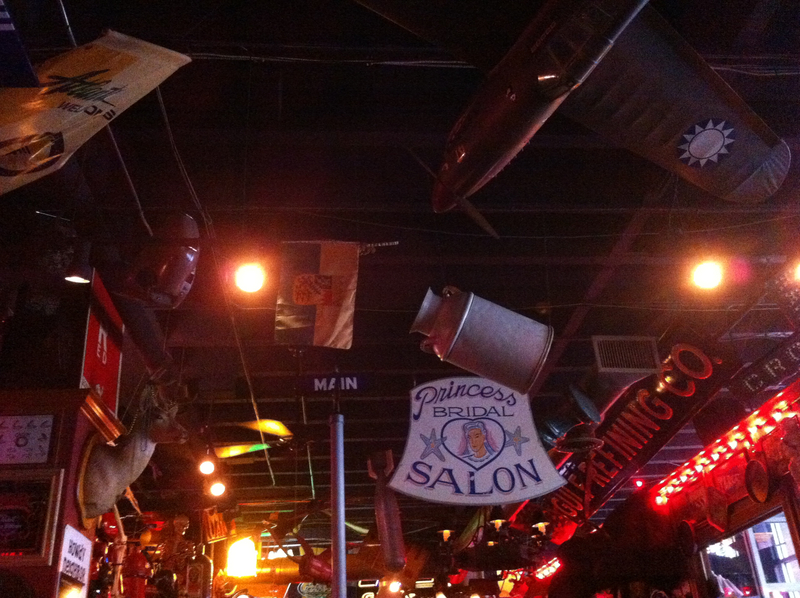 They have two locations in town, the slightly more upscale midtown location (Peachtree near 8th) and the original in Little Five Points (where you enter through the mouth of a giant skull). This night, we ate at the Midtown location, “we” being me and our oldest daughter. Our girls were fairly devastated by being banned from the Vortex, so once they each hit 18, we went for a meal shortly thereafter. And we still go about once every 8 weeks. Wh en I say slightly more upscale, the ceiling and walls are slightly less crowded with “stuff” and the neighborhood around the bar is a little less edgy. One of my favorite memories of dinner with friends in Little Five was around Christmas one year, when “Santa’s Pub Crawl” made a stop. A tall, fairly drunk Santa, with a parade of cross-dressing elves on tow. The menu is burger based – it’s what they’re best known for – but they have other sandwiches, salads (I imagine if a man orders one he is looked at with derision by the tattooed and pierced wait staff) and hot dogs. The menu is also a great read, and an indication of their attitude. Man V. Food paid them a visit during the first season, trying the Triple Coronary Bypass (from the menu: “two half-pound Vortex sirloin patties stacked inside three grilled cheese sandwiches, topped with two fried eggs, eight slices of American cheese, ten slices of bacon and plenty of mayo on the side. With this burger they choose your side for you, and it’s a big bowl of fries and tots covered in our cheesy-cheese goo. This super-stack is a heart attack waiting to happen”) on the Atlanta episode. I’ve never mustered up the courage to try one of the Coronary Bypass Burgers (there’s also a Single – on a bun, not Grilled Cheese – and Double), but I will before I hit 50. 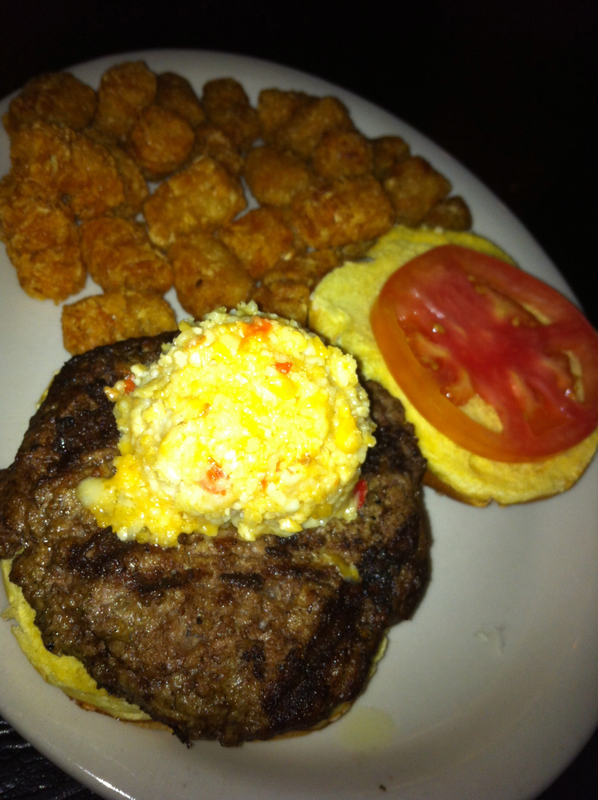 This night, I elected for a basic Vortex Burger (half pound of fresh ground sirloin on a sesame seed egg bun) with pimiento cheese. They cook your burger the way you ask for it, assuming that you’re an adult and can make your own choices. I appreciate that. And they give you a choice of sides that includes tater tots. How can you go wrong? As usual, the burger was cooked just as I requested, was very tasty and they gave me more tots than I could eat, served with just a pinch of surliness. I’ll be back again soon.